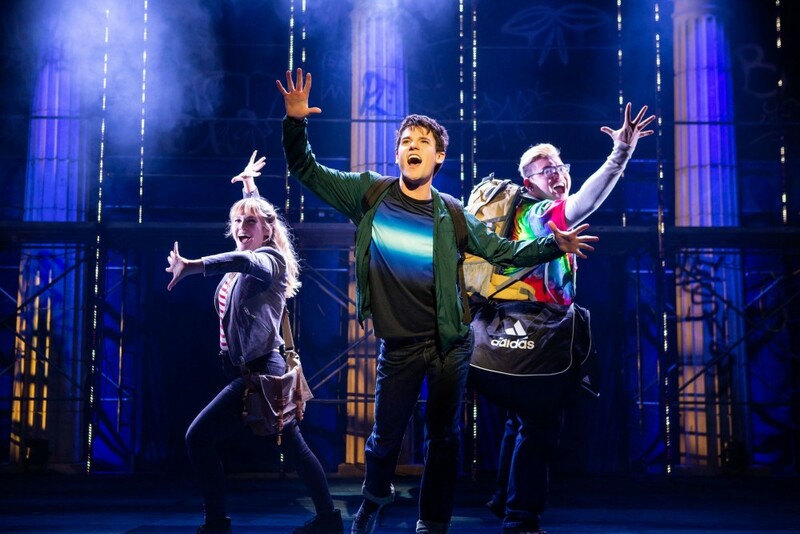 I went in-depth with three of the stars from The Lightning Thief: The Percy Jackson Musical. You’ll find unique stories from my 10 minute conversations with Chris McCarrell (Percy Jackson), Kristin Stokes (Annabeth Chase) and Jorrel Javier (Grover Underwood and Mr. D (Dionysus). Shoshana: What’s it like to play the titular character in The Lightning Thief: The Percy Jackson musical? Chris: It’s pretty awesome. He’s the exact type of superhero, in his own right, that I want to be playing. I feel really lucky in the way that what makes him really different than most titular characters is the type of difference I want to be putting out into the world as positive concepts. Shoshana: It looks like you’ve been having a lot of fun interacting with your cast-mates and fans. How has interacting with the fans, whether it’s been through social media or in person where you’ve been touring, how has that relationship been? Chris: I think it’s a huge reason a majority of us decided to tour because we’ve heard so many stories of people wanting to see this musical, needing to see this musical, ‘cause the story was really resonating with them, but they couldn’t fly to New York and buy a New York ticket price. By us taking the show out to them, it will make it a lot easier for the young people to be able to see this show. 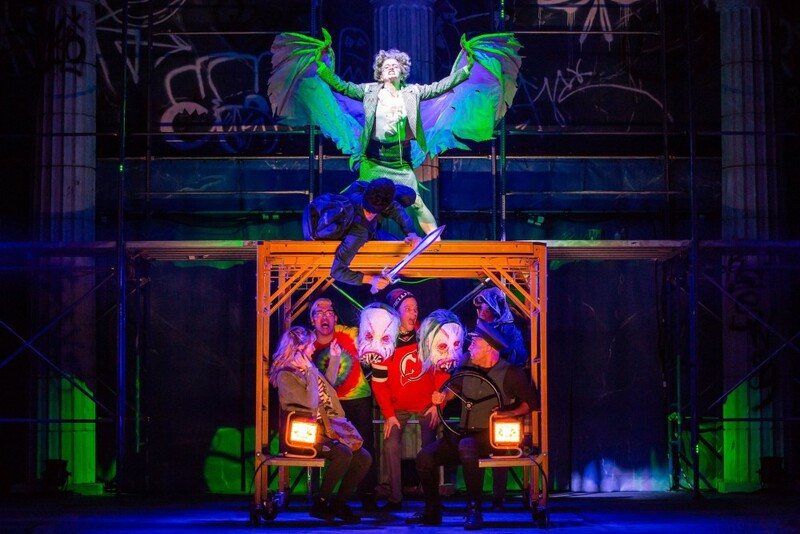 I think we forget sometimes what a huge ask it is of a New York production to have an entire country fly to it, you know what I mean? Not a lot of families have that amount of time and money available to do that. Especially this show, I think the types of people that it speaks to are not always the people that have a family life together enough to be able to pull something off like that, to have a New York vacation to see a show. So, in particular, this show feels like it needs to be brought to the country in a way that makes it more accessible. Shoshana: Well said, I think that’s a true and fair point. Were you a fan of the boos or Greek Mythology before joining the cast? Chris: I played this game growing up called, “Age of Mythology.” It was a computer game and that’s how I got into Greek Mythology in a similar way that the books got so many people into Greek Mythology. It’s fun and modern and exciting. It’s a computer game where you’re building this city and you would have battles and train Pegasi. It was all the Greek Mythology characters built into this video game. Shoshana: I’m sure you get asked this all the time, but if you could be a Greek God, or the son of one, who would you choose? Chris: I think I would be the son of Zeus, honestly. Since I was a little kid, I loved wind and weather. So, the idea of having the power of lightning and being up in the sky, I love that. I’ve always been fascinated by the sky. When I was younger, I would fly kites. I would get so into it that I would go to the store and buy fishing line and I would tie roles and roles of fishing line together. I would be flying these kites in my backyard that were *literally* miles into the sky and it would take me hours to reel them back in because I would spend all day seeing how high I could get them. 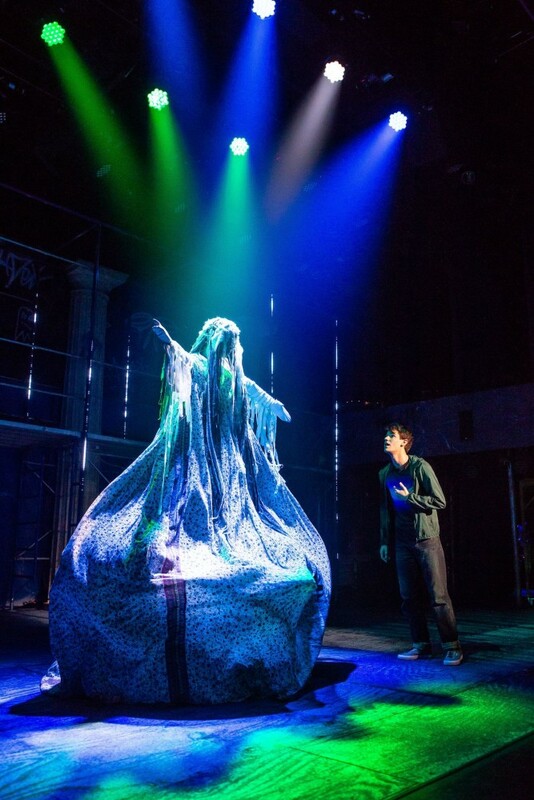 Shoshana: I would be remiss if I didn’t talk about this amazing connection between The Lightning Thief and Be More Chill. Now both in New York, what’s that connection like? Shoshana: Is there anything else you want to make sure the fans hear directly from you? Chris: The show has a New York energy about it, Percy Jackson is from New York City and is on a quest to LA, it feels like what this tour is. We’ve gone on this quest across the country and now we’re returning home to camp in a way. We are very excited and we’re going to try to blast the roof off that place, so get to the Beacon! It’s only one weekend and the cast is gearing up and we’re going all out, that’s for sure. Jalynn Steele and Chris McCarrell. Shoshana: You’ve been on this journey from the beginning, what’s it like to be back on tour? Kristin: It has been a journey. We joke on the show that Annabeth has this line, “Five long years stuck at camp” and that’s the exact amount of time I’ve been working on this show now. I wouldn’t say I’ve been stuck at camp, I’ve been very gracious and excited to see how this journey has unfolded. We went from a one-hour to a two-hour full Broadway musical, it’s been the most fun and surprising. I’m here for the ride and I’m so happy, I’m sticking with it. 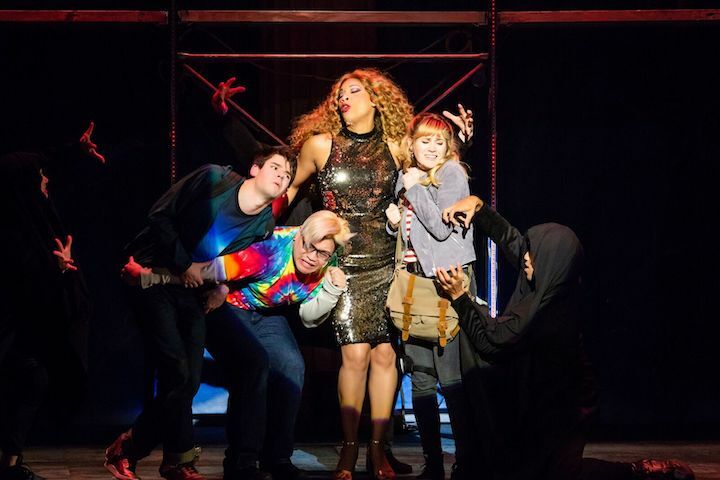 Shoshana: Joe Tracz, Stephen Brackett and George Salazar… there’s a huge connection between your show and Be More Chill. Is that a show you’ll be able to see while you’re in New York? What’s that connection like? Kristin: We kinda call it our sister show because we’re so connected to it. I actually did one of the first readings of Be More Chill. I got to sing, “Rich set a fire” the very first time, so I was Jenna Rollan in one of the very first readings. We’re all very close to the Be More Chill family and Joe Iconis is such a supporter of Rob Rockiki, they’re best buds and it’s like our sister show. It feels so cool to say they’re on Broadway and we’re touring, it feels a little bit like we’re conquering the world, it’s really cool. Kristin: [Laughing] You do it for the deep cuts, I really appreciate that! I was trying to be the scariest Minotaur possible, but then it would all be ruined when I got off of their shoulders and I would have this big hat on. They’d be like, wow, here’s this 5’3 little person getting off and they were like, “You just look like the littlest Minotaur” [pronounced wittlest Minotaur, laughing] like I got up on my big boy shoulders and was trying to scare this boy, Percy. So then Rob literally came back in rehearsal the next day and was like, “Hey I wrote this joke of a song called, “The Littlest Minotaur” and it was like me and Rob’s little song that we would sing throughout the mini-rehearsal processes. Then when we got to The Green Room 42 he was like, “Hey, would you want to do “Littlest Minotaur?” I was like, I would love nothing more, it was really great and add on the background vocals and just share some of the silliness that is the rehearsal process of this show. Shoshana: I want to talk about your journey into The Lightning Thief and how you heard about it. What it’s like to now be on the first national tour. Jorrel: I was actually a massive fan of the books. I read it all through middle school it’s actually how I got through middle school. I had been following the book here and there as a 13-year-old. Then I heard that Theatre Works had done a one hour musical, so I was trying to scrounge the Internet for any clues here and there. My friends, actually, my freshman year of college, ended up doing the one-hour Theatre Works production of The Lightning Thief, so I was really ecstatic to find out that it was still alive. That the process of the show was still going on because obviously as a massive fan, it was definitely a show I wanted to get involved with. Fast forward four years, I graduate from college and my agents get me this audition for the first national tour. The year prior, I had known they had just done a very successful New York run, that they had produced an album. I had scrounged the Internet for every bit and shrapnel of the album, ended up buying it for myself and fell in love with the musical. So, when I got the audition, I knew for sure this was a production I wanted to get involved with and believe the audition went well. I got the offer so it’s been kind of a dream ever since. Shoshana: You’re playing Grover Underwood and Mr. D, two very unique roles. What’s your process been like? Jorrel: Because I had read the series prior to ever being involved in the show, it was definitely a little bit easier for me. Simply because I had this arsenal of knowledge of who Grover is, who Mr. D is, I know the roles they play in the show. I know the roles they played in the novel series and the source material, which is the first book. I have all of this knowledge, I just have to figure out how Grover and Mr. D lives in me. As an actor, I’m a very physical person. I like to get into my characters physically, and I feel like if I find their physicality and the vocal quality that each character has, it’s like my gateway into figuring out how that character lives in my body. The Beacon Theatre 2124 Broadway, New York, NY 10023, March 28 thru 31, 2 hours including a 15 min intermission.